Breast cancer, Breast surgery, Tumor recurrence, Tumor metastasis, Risk factors. As a common malignant tumor, breast cancer is mainly treated with surgery, postoperative radiotherapy and chemotherapy. In recent years, more and more patients would like to retain the breast besides a radical cure. In this case, breast conserving surgery has become more and more widely used on clinic . Relevant results in recent years have showed that the tumor metastasis rate and survival rate of the patients treated with breast conserving surgery in stages I and II were like those of the patients receiving total mastectomy. Moreover, the quality of life of patients treated with breast conserving surgery was better and their rate of local recurrence was higher than that of the patients undergoing total mastectomy [2,3]. Therefore, the analysis and summary on risk factors of the recurrence and metastasis of breast cancer after breast-conserving surgery has important necessary to provide clinical guidance for the selection of operation and predict recurrence and metastasis and prognosis. This study retrospectively analysed the clinical data of 102 cases with breast cancer that underwent breast conserving surgery in our department of general surgery from January 2011 to December 2014. The results were reported as follows. 102 cases at the age of 21-64 (50.5 ± 1.5) and received breast conserving surgery in our hospital department of general surgery were selected randomly from January 2011 to December 2014. TNM stage: 57 cases of stage I, 30 cases of stage II, 5 cases of stage III, and 10 cases were unknown. Among them, 18 cases were treated with local extensive resection and 84 cases underwent quadrant resection+axillary lymph node dissection. Treatment status: Among the 102 cases, 37 patients received chemotherapy before operation and they were treated one time per week and 2-3 times continuously. The remaining 65 patients underwent surgical treatment, including extensive local excision of the tumor (16 cases), resection margins and tumor distance of 2-3 cm and reconstruction of breast shape after resection. In addition, there were 77 patients (75.5%) who received radiotherapy and chemotherapy after operation. IBM SPSS 17 statistical software was used for data statistics and analysis. Cox proportional hazards regression analysis was used to analyse the risk factors. The Cox model was represented by hazard ratios with 95% confidence intervals and related P value. If P<0.05, the difference was statistically significant. Among the 102 patients, 10 patients had ductal carcinoma in situ (9.8%) and 92 (90.20%) had invasive carcinomas. The tumor volume was less than 2 cm in 72 (70.59%) cases but more than 2 cm in 92 cases (29.41%). There were 18 cases (17.65%) of N0 with Lymph node metastasis stage, 14 cases (13.73%) of N1, 30 cases (29.41) of N2, 30 cases (29.41) of N3 and 10 cases (9.80%) of NX (Table 1). Table 1. General clinical feature of patients. The 102 patients were followed up by one to five years and the results showed that 11 (10.78%) cases were recurred, 9 cases (8.82%) were transferred and the survival rate for 5 y was 96.08% (98/102). Among the 4 patients who died after the operation, 2 died because of breast cancer recurrence and metastasis and 2 died because of other diseases (Figure 1). 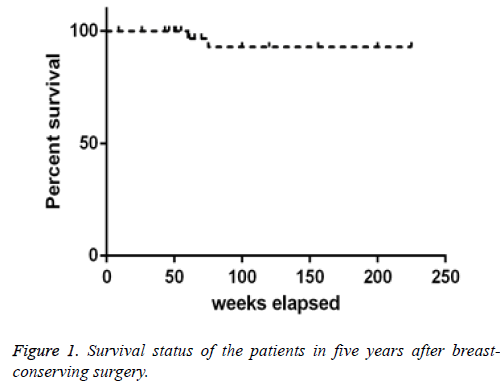 Figure 1: Survival status of the patients in five years after breastconserving surgery. The patients’ age, size of tumor, margin status, HER-2 status, postoperative radiotherapy and chemotherapy, lymph node status were included into single factor variable. We concluded that the related factors affecting tumor recurrence were the size of tumor, margin status, HER-2 status, postoperative radiotherapy and chemotherapy, lymph node status and the related factors affecting tumor metastasis were about age, size of tumor, HER-2 status, postoperative radiotherapy and chemotherapy, lymph node status (Table 2). Table 2. Analysis on relative risk factors of recurrence and metastasis after breast-conserving surgery for patients with breast cancer after 5 y. In recent years, breast-conserving surgery has become the first option for patients who have breast cancer, especially for those in early stage. According to recent studies, there was no significant difference in the rate of distant metastasis and survival of breast-conserving surgery when compared with mastectomy. Behm EC, Beckmann KR, Dahlstrom JE. Surgical margins and risk of locoregional recurrence in invasive breast cancer: an analysis of 10-year data from the Breast Cancer Treatment Quality Assurance Project. Breast 2013; 22: 839-844. Morrow M, Harris JR, Schnitt SJ. Surgical margins in lumpectomy for breast cancerdbigger is not better. N Engl J Med 2012; 367: 79-82. Miles RC, Gullerud RE, Lohse CM. Local recurrence after breast-conserving surgery: multivariable analysis of risk factors and the impact of young age. Ann Surg Oncol 2012; 19: 1153-1159. Kim K, Chie EK, Han W. Age, 40 years is an independent prognostic factor predicting inferior overall survival in patients treated with breast conservative therapy. Breast J 2011; 17: 75-78. Chung AP, Huynh K, Kidner T. Comparison of outcomes of breast conserving therapy in multifocal and unifocal invasive breast cancer. J Am Coll Surg 2012; 215: 137-146. Ali AN, Vapiwala N, Guo M. The impact of re-excision and residual disease on local recurrence after breast conservation treatment for patients with early stage breast cancer. Clin Breast Cancer 2011; 11: 400-405.
van der Leij F, Elkhuizen PH, Bartelink H, van de Vijver MJ. Predictive factors for local recurrence in breast cancer. Semin Radiat Oncol 2012; 22: 100-107. Peltoniemi P, Huhtala H, Holli K, Pylkkänen L. Effect of surgeons caseload on the quality of surgery and breast cancer recurrence. Breast 2012; 21: 539-543. Vrijens F, Stordeur S, Beirens K. Effect of hospital volume on processes of care and 5-year survival after breast cancer: a population-based study on 25000 women. Breast 2012; 21: 261-266. In H, Bilimoria KY, Stewart AK, Wroblewski KE, Posner MC. Cancer recurrence: an important but missing variable in national cancer registries. Ann Surg Oncol 2014; 21: 1520-1529. Gooiker GA, van Gijn W, Post PN. A systematic review and meta-analysis of the volume-outcome relationship in the surgical treatment of breast cancer. Are breast cancer patients better off with a high volume provider? Eur J Surg Oncol 2010; 36: 27-35.